Brisbane, Australia&apos;s Moreton Bay is foaming with short-spaced three- to five-footers and a brisk spring breeze. The just-launched Warren S87 speeds across the water at 25 knots as if the surface is glass, while a 50-foot sport yacht with a flailing photographer on the foredeck tries fruitlessly to keep up. I&apos;ve flown halfway around the big, blue marble to get a first look at this Down Under export, and while it will be six more weeks before I get wheel time, I already know the 23-hour flight was worth it. Fast forward six weeks. The Fort Lauderdale International Boat Show has just closed, and I&apos;ve finally caught up to the S87, side-tied behind a home in Fort Lauderdale. Once again I&apos;m struck by her low profile, aggressively raked, metallic silver, retractable-roof hardtop, and blue-and-silver hull. The work of Dave Warren, a noted Australian designer and builder of luxury production and custom yachts for more than 20 years--the S87 somehow manages to be both racy and cosmopolitan. As for the racy side, the S87&apos;s modified-V hull, courtesy of naval architect Peter Lowe, really shone on a flat-calm Atlantic on test day. I&apos;m talkin&apos; an average top speed of 36.6 mph and a comfortable cruise of 30.1 mph, remarkable when you consider a few facts. One is that this yacht is no lightweight; she displaces 44 tons. Why? Because she&apos;s built for open water with a hull that&apos;s solid FRP from her keel to her chine and hull sides and topsides that are of end-grain balsa sandwich to add rigidity. All structural members, such as the plywood bulkheads, are installed while the hull is in the mold to maintain its shape while also enhancing its structural integrity. The engine beds are laminated into the stringers, and there are three watertight bulkheads. The second fact is that my test boat possessed the mildest engine option available, a pair of 1,300-hp MANs rigged as straight inboards. 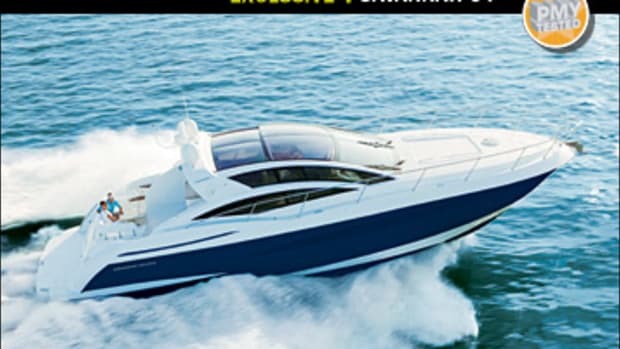 MANs and MTUs up to 1,800 hp are available, as are Arneson Surface Drives, for diehard performance enthusiasts. And one last fact: My test boat was underpropped. I discovered that her MANs were 80 rpm over their rated rpm, so it&apos;s fair to speculate that adding pitch will produce more speed and better efficiency. And while that run across Moreton Bay showed the S87 dispatching frothy chop with authority, my test day offered me an opportunity to see a different side of her hull: full-throttle, flat-water performance. After I&apos;d dutifully recorded the S87&apos;s performance numbers, I had the chance to sit at her centerline helm, in her electrically adjustable and quite comfortable Besenzoni leather helm seat (standard like everything onboard the S87), which is flanked by two identical companion seats. I grabbed the wheel, which is linked to an effective power-assisted hydraulic steering system that enabled me to drive the S87 as if she were a 40-footer. 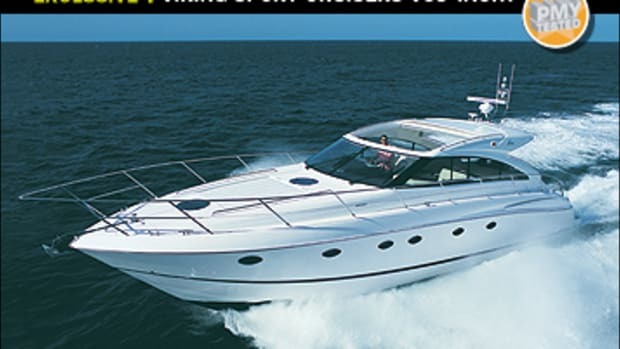 Her single-lever MAN electronic controls were as smooth as the two-boat-length turns that we effortlessly carved at cruise rpm. I did note that during hard-over turns at that speed my view to inboard was limited by her narrow side windows and moderate heel. However her rpm dropped only about 100 rpm in the turn and quickly returned to normal engine speed as soon as she straightened out. But to me the most remarkable thing about the S87&apos;s handling was her running attitude. This boat does not have trim tabs, yet her angle never exceeded four degrees and I never lost sight of the horizon. Even though she&apos;s 87 feet, I believe she could be easily handled by an owner-operator, especially with the CCTV system that allows you to see aft (and into the engine room). 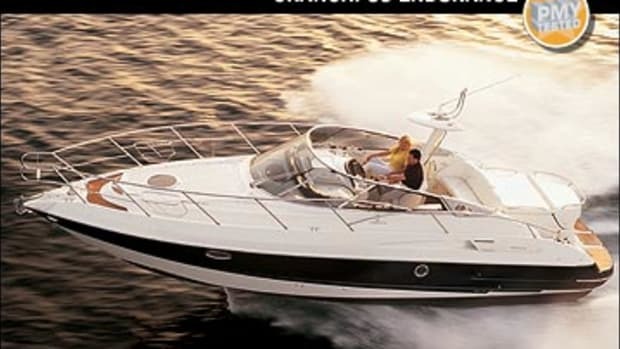 Contributing to my driving pleasure was a helm that was both comprehensive and cleanly laid out, with two Raymarine E120s, a Furuno WAAS/GPS, two MAN engine diagnostic monitors, and other assorted helm gadgetry, all easily readable from the wheel position. 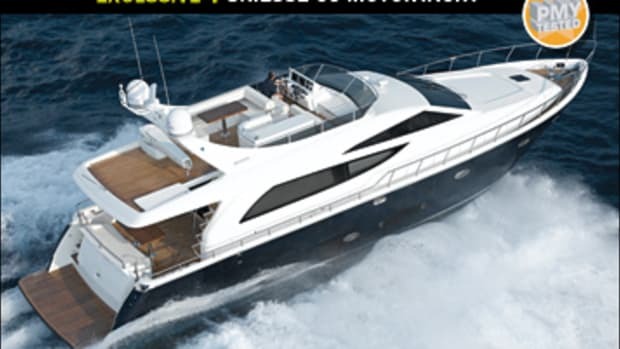 I could continue to write about this boat&apos;s handling, build, and quietness--at WOT my decibel meter never read above 73 dB-A (65 dB-A is the level of normal conversation)--but then I&apos;d ignore an interior that&apos;s as sophisticated as a big-boat interiors get. From the cockpit, the curved smoked sliding-glass doors silently open at the push of a button to reveal a saloon adorned in high-gloss madrona burl, Rosso Levanto marble, and Fabrica carpet. Immediately upon entering, there are two identical lounges covered with soft cotton fabric which offer a comfortable view of the retractable 42-inch NEC plasma TV residing in a center marble-topped credenza. 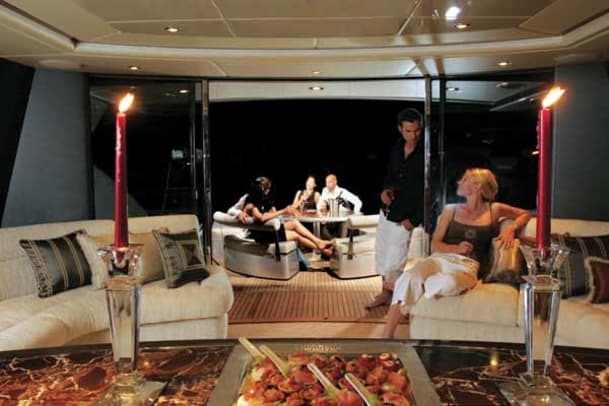 When the TV is lowered, the saloon, formal dining area just forward, and helm fully forward become one large gathering area. Light pours through the curved side windows and an expansive three-panel windshield. 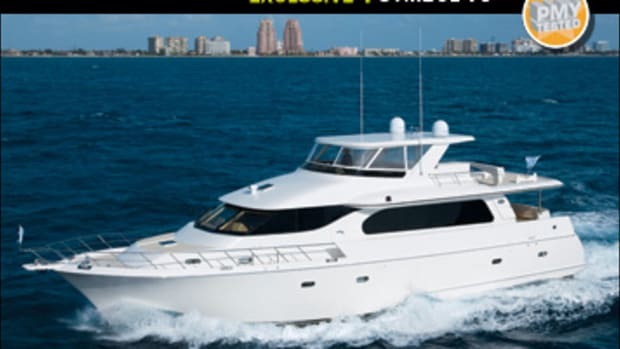 And this open feel extends to the lower deck, which you access via a port-side companionway, down two steps to a landing, and then down five more steps to a second entertaining area with another 42-inch plasma TV to port and galley to starboard. While you&apos;re surrounded by hull, portholes allow light in and keep the space bright. The galley rivals most upscale home kitchens, being complete with Miele appliances, including the ever-important cappuccino machine. The details here are remarkable. All doors for the overhead stowage areas have struts that allow you to just drop them, and they slowly self-close. In addition, all the Queensland maple veneer trim is flawlessly applied to aluminum frames--some curved--by a proprietary process. It complements the book-matched madrona burl and adds to the warm feeling. Warren has also ensured a good night&apos;s sleep for all aboard, offering a three- or four-stateroom layout. 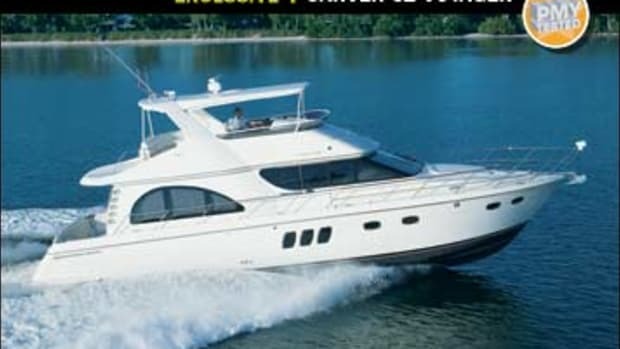 My test boat had the latter, with a forepeak VIP with island berth, two guest staterooms aft of the galley (one with a double berth and one with side-by-side singles), and a full-beam master all the way aft. (Crew quarters are just forward of the engine room and accessed from the cockpit.) The VIP, which has an en suite head, is entered from the galley and up a four-inch step, which has a two-inch lip at the top. I consider that a trip hazard, and I&apos;d like to see the step flush. Port and starboard staterooms lie just aft of the laundry/pantry and day-head, respectively, and are great rooms for kids. The master stateroom is finished with the aforementioned woods and padded bulkheads clad in mammut leather. The owner&apos;s en suite head is finished in a clear, anodized, Cambridge fluted aluminum, which nicely accents the marble vanity. Like all the areas on the Warren, the fit and finish here is top notch. 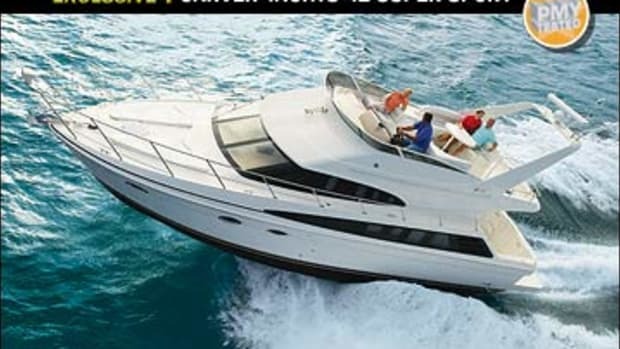 The S87 is Warren Yachts&apos; first boat that was designed with the U.S. market primarily in mind, and I think the result is spot-on in almost all regards. While I found her engine room tight outboard of the engines, mostly due to the two standard 22.5-kW Onan gensets, there&apos;s plenty of space everywhere else, something Americans demand. 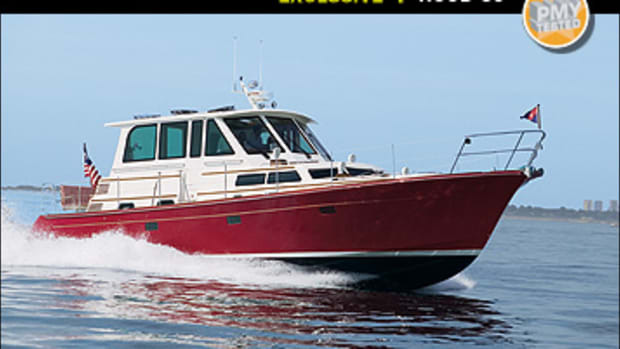 Her headroom exceeds 6&apos;8" in most areas and seven feet in some, and foot-wide teak-clad side decks offer easy and safe access to the foredeck sunpad. Also appealing to Yanks are features like air intakes integrated into the side decks and the array of mist collectors and baffles that ensure no water gets to the powerplants. And, of course, there is her performance. When you consider the extensive list of standard equipment, the S87&apos;s $5.9-million price makes her a reasonable buy among larger sport yachts, although in this range it&apos;s difficult to compare yachts. 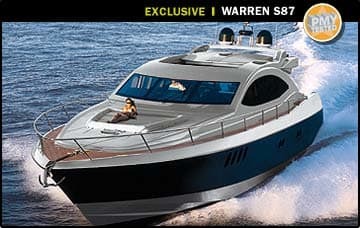 But if you&apos;re looking for all that plus striking beauty and superior craftsmanship, the S87 might just turn your head.